DOVER, Del., Feb. 5, 2019 /PRNewswire/ -- Harrison Barnes, 17 and Shelby Farris, 13, both of Bridgeville, today were named Delaware's top two youth volunteers of 2019 by The Prudential Spirit of Community Awards, a nationwide program honoring young people for outstanding acts of volunteerism. As State Honorees, Harrison and Shelby each will receive $1,000, an engraved silver medallion and an all-expense-paid trip in early May to Washington, D.C., where they will join the top two honorees from each of the other states and the District of Columbia for four days of national recognition events. During the trip, 10 students will be named America's top youth volunteers of 2019. Harrison, a senior at Woodbridge High School, founded a nonprofit organization called "GearUp" that promotes bicycle riding as a way for young people to overcome personal challenges. He does this by refurbishing and giving away free used bikes, offering prizes for reaching weekly cycling goals, hosting an annual multi-state bicycle event for children of military families, and mentoring young cyclists who have physical or developmental disabilities. When Harrison was diagnosed with an autistic spectrum disorder as a young child, experts said he would probably not graduate from high school or ever become independent. But at age 12, his parents took him to a bicycle racetrack, "and a whole new world opened up for me," he said. As he became a racing enthusiast, Harrison's social and academic skills improved dramatically. Wondering if there really was a connection between bike riding and the challenges that come with having special needs, he researched the subject and discovered that kids who ride bikes regularly have improved self-esteem, confidence, social skills, communication abilities and school grades. "I decided I wanted to help make sure as many kids as possible could ride bikes," he said. To date, Harrison's GearUp initiative has recruited mentors to help more than 100 children with disabilities enjoy the benefits of bike riding. He and his partners have collected used bikes and refurbished them for kids who cannot afford to buy a bicycle. Last summer, over 120 kids signed up to ride at least 10 hours a week in GearUp's Summer Bike Challenge, earning prizes and rewards provided by sponsors. And at Harrison's "Grab Life by the Bars" event, more than 300 volunteers in nine states helped 1,500 children from military families learn to ride bicycles. "Riding a bike can make a difference in the life of other kids just like it did for me," he said. Shelby, an eighth-grader at Woodbridge Middle School, creates pre-printed greeting cards and then encourages people across the country to color them and send them to veterans, hospital patients, the elderly, grieving families and others who need a little cheer in their lives. A few years ago, Shelby's mother was staffing an event booth asking attendees to make greeting cards for veterans, with relatively little success. "I came up with the idea of making cards that looked like a coloring book page, figuring that maybe if all people had to do was color, they wouldn't be as reluctant to make a card," said Shelby. It worked! At the next event, nearly 100 people created cards. Realizing that this was a way to use her love of art to serve others, Shelby began creating "Coloring Card" templates and distributing them to individuals and organizations such as Girl Scout troops, American Red Cross chapters, schools, churches, summer camps and children's hospitals. She also traveled to fairs, festivals and other events to solicit participation in her card project. In addition, Shelby uses a website and social media to suggest other things people can make to brighten someone's day. So far, she has collected and distributed more than 7,000 coloring cards, and over 3,500 other volunteers have reported completing more than 10,000 projects in concert with Shelby's "HeartArt" campaign. "Simple acts of kindness, like helping someone make a greeting card and then sending it to someone to give them a smile, can make a world of difference," said Shelby. The program judges also recognized two other Delaware students as Distinguished Finalists for their impressive community service activities. Each will receive an engraved bronze medallion. Kayla Bright, 16, of Middletown, Del., a junior at MOT Charter High School, is a senior cadet-member at the Delaware City Volunteer Fire Company, where she helps people involved in medical or disaster situations and assists new cadets during their training. Inspired by her great-grandfather, who served in the department for 75 years, Kayla joined the moment she was eligible at age 14; she has taken numerous classes to develop her skills in firefighting, vehicle rescue, hazmat awareness and more. Jacqueline Means, 16, of Wilmington, Del., a junior at Delaware Military Academy, founded the "Wilmington Urban STEM Initiative" (W.U.S.I.) to inspire a love of science, technology, engineering and math among girls in need in her hometown. Through W.U.S.I. events, she has brought hands-on science experiments, interactive anti-bullying demonstrations, inspiring talks from prominent women and a vision of a brighter future to more than 300 girls. "These young volunteers learned and demonstrated that they can make meaningful contributions to individuals and communities through their service," said Prudential CEO Charles Lowrey. "It's an honor to recognize their great work, and we hope that shining a spotlight on their service inspires others to consider how they might make a difference." "Each of these honorees is proof that students have the energy, creativity and unique perspectives to create positive change," said JoAnn Bartoletti, executive director of NASSP. "We commend each of the 2019 honorees for their outstanding volunteer service, and for the invaluable example they've set for their peers." The Prudential Spirit of Community Awards represents the United States' largest youth recognition program based solely on volunteer service. All public and private middle level and high schools in the country, as well as all Girl Scout councils, county 4-H organizations, American Red Cross chapters, YMCAs and affiliates of Points of Light's HandsOn Network, were eligible to select a student or member for a local Prudential Spirit of Community Award. These Local Honorees were then reviewed by an independent judging panel, which selected State Honorees and Distinguished Finalists based on criteria including personal initiative, effort, impact and personal growth. While in Washington, D.C., the 102 State Honorees – one middle level and one high school student from each state and the District of Columbia – will tour the capital's landmarks, meet top youth volunteers from other parts of the world, attend a gala awards ceremony at the Smithsonian's National Museum of Natural History, and visit their congressional representatives on Capitol Hill. On May 6, 10 of the State Honorees – five middle level and five high school students – will be named America's top youth volunteers of 2019. These National Honorees will receive additional $5,000 awards, gold medallions, crystal trophies and $5,000 grants from The Prudential Foundation for nonprofit charitable organizations of their choice. Since the program began in 1995, more than 125,000 young volunteers have been honored at the local, state and national level. The program also is conducted by Prudential subsidiaries in Japan, South Korea, Taiwan, Ireland, India, China and Brazil. In addition to granting its own awards, The Prudential Spirit of Community Awards program also distributes President's Volunteer Service Awards to qualifying Local Honorees. 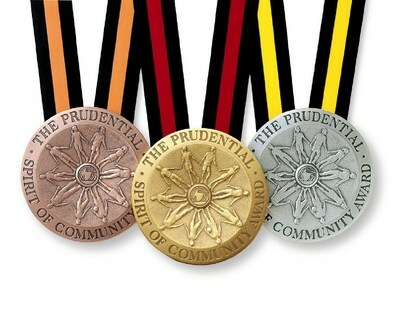 For information on all of this year's Prudential Spirit of Community State Honorees and Distinguished Finalists, visit http://spirit.prudential.com or www.nassp.org/spirit. The National Association of Secondary School Principals (NASSP) is the leading organization of and voice for principals and other school leaders across the United States. NASSP seeks to transform education through school leadership, recognizing that the fulfillment of each student's potential relies on great leaders in every school committed to the success of each student. Reflecting its long-standing commitment to student leadership development, NASSP administers the National Honor Society, National Junior Honor Society, National Elementary Honor Society, and National Student Council. Learn more at www.nassp.org. Prudential Financial, Inc. (NYSE: PRU), a financial services leader, has operations in the United States, Asia, Europe, and Latin America. Prudential's diverse and talented employees are committed to helping individual and institutional customers grow and protect their wealth through a variety of products and services, including life insurance, annuities, retirement-related services, mutual funds and investment management. In the U.S., Prudential's iconic Rock symbol has stood for strength, stability, expertise and innovation for more than a century. For more information, please visit www.news.prudential.com.